Treat your birds with a protein-rich seed bell! 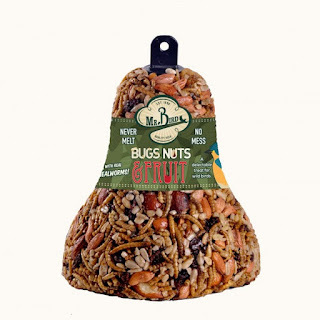 This all season bell is a delightful fruit and nut treat for your favorite backyard birds. Attract finches, cardinals, chickadees, nuthatches, wrens, titmice, woodpeckers and many more. Seed Bells are an ideal way to offer your birds a high-energy supplement throughout the year. It consists of mealworms, tree nuts, sunflower hearts, peanuts, raisins and cranberries, it is sure to attract many birds!